Sinus Infection Treatment at William R. Bond, Jr. M.D. 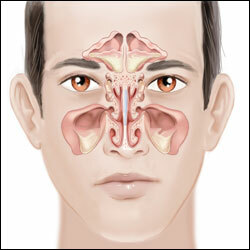 Sinus Infection Treatment in Washington, D.C. Inside the sinuses are ridges called turbinates, which work to humidify and filter the air we breathe. While our sinuses function as one of our main senses, they can also cause severe complications for us. From allergies to sinusitis, our sinuses can help us breathe and smell, but they can also cause us more problems and infections than we would like. Some sinus infection conditions that you might experience include acute sinusitis, chronic sinusitis, allergic rhinitis, deviated septum and nasal polyps. When any of these sinus conditions occur, it is important to visit your ENT doctor for further diagnosis and treatment planning. Visit our Washington, DC ENT doctor for more information on sinus issues!